What do MSSPs stand to gain from implementing software-defined wide area networking (SD-WAN) into their practice? If the data has anything say – a lot. Business buying and deploying SD-WAN are indicating that they want additional protection as more of their workloads traverse the public internet. A recent Vanson Bourne commissioned by Barracuda Networks found that 92 percent of IT leaders view security as the top criteria for picking an SD-WAN solution. This presents an opportunity for security experts to gain another share of their customers’ technology spend. With security at the top of mind for SD-WAN specialists this year, it’s no surprise that security specialists have joined the SD-WAN market. Multiple long-established security vendors have recently declared themselves SD-WAN players. Masergy launched a service in 2016, but 2018 saw Barracuda, Fortinet and Forcepoint publicize their entrance and find a spot in Gartner’s latest Magic Quadrant. The growing customer concerns over securing their network inspired the founders of Cato Networks, a security-minded SD-WAN company with roots in Check Point Software Technologies. Terry Traina, Masergy’s senior vice president of engineering, told Channel Futures that enterprises are more and more looking to service providers that provide “custom secure networks.” The increase of cloud migration, workloads and security concerns helped spur the trend. Traina said businesses more than ever don’t want to compartmentalize security solutions from network solutions. “[Masergy] has seen an increased demand from enterprises [that] want a single partner to provide global networking with SD-WAN and managed-security solutions with 24/7 monitoring and coverage,” Traina said. 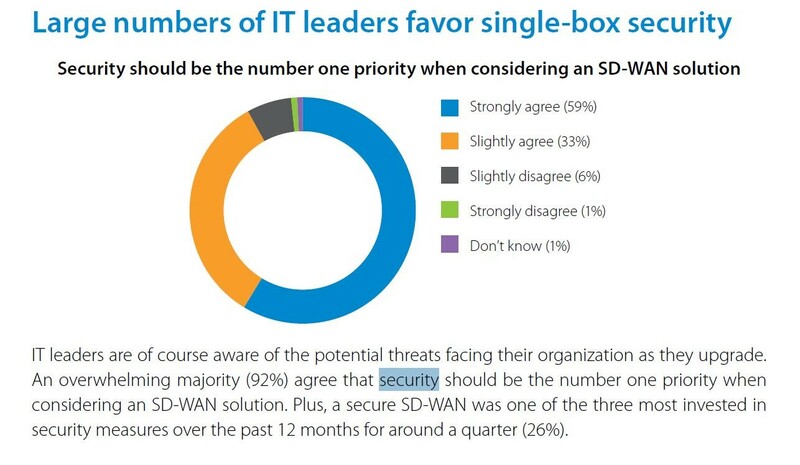 The other security vendors agree that a single-box solution is the best option, but a good number of customers don’t share that view. Barracuda’s study found a near tie in preference between adding two separate SD-WAN and security solutions — an SD-WAN “specialist” solution with built-in security, and an advanced security vendor’s SD-WAN solution. Perhaps the newness of these security vendors in the SD-WAN market has kept customers from seeing the value of single box solution for security and SD-WAN. However, most of the pure-play SD-WAN vendors are trying to go single box. Aryaka, Silver Peak and VeloCloud are among the SD-WAN specialists announcing integrations with security vendors in order to offer a holistic solution. But Barracuda’s Ezra Hookano, vice president of channels, said in an interview with Channel Partners last month that a single box solution from a security vendor outshines a single box solution from a networking vendor. “I would never let somebody who’s just pure connectivity actually manage my security. Folks are very afraid of that kind of architecture,” he said. Level of expertise will be the ultimate deciding factor for security companies that attack SD-WAN, according to Klaus Gheri, Barracuda’s vice president and general manager of network security. He noted that more than 90 percent of IT leaders see technical support and consultancy as top priorities when it comes to choosing an SD-WAN provider. For the MSSPs that expand their arsenal and properly educate themselves, there’s a very juicy opportunity at hand. Stephan Tallent, Fortinet’s senior director of MSSP and service enablement, wrote earlier this year that the “two-for-one security-plus-SD-WAN package deal” could allow MSSPs to replace their customers’ telecom service provider. “Needless to say, Fortinet Secure SD-WAN arms MSSPs with an irresistible value proposition … by upending the conventional approach to providing SD-WAN services by making traditional SD-WAN service providers redundant and including security as an integral part of any SD-WAN offering rather than an add-on,” he said.